Shall I start with the bath tub race or the camping weekend? 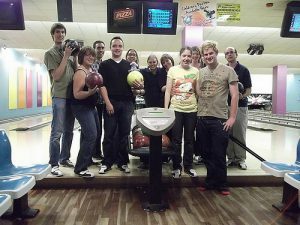 How about the 1140 district ten pin bowling evening? To say Camberley Rotaract has been busy would be an understatement and the busier the better I say! 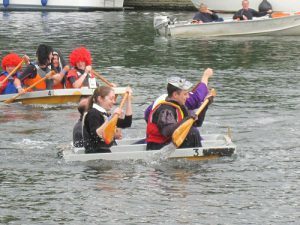 Four Rotaractors headed to Henley on Thames on a Saturday morning in August with fancy dress gear and the prospect of racing in a bathtub against other crazies all in the name of fun. We dressed as Harry Potter characters: Dumbledore, Luna Lovegood, a plump Harry Potter and a scary Death Eater all looking only slightly ridiculous in life jackets. The bathtub was actually two tubs bolted together and with the plug holes not cut out (mercifully); it wasn’t the most stable of water-craft, as demonstrated by one team that sank within seconds of the start horn. Our team came a respectable 2nd and only got slightly wet. We actually got wetter when the heavens opened up a downpour at lunch time! The following weekend was the annual Banbury camping weekend; we all met at the site for mid afternoon and raised our tents pronto as the rain came down. First time Banbury campers got acquainted with the site, while experienced campers got a chair out and cracked open the first of many beers/wines. 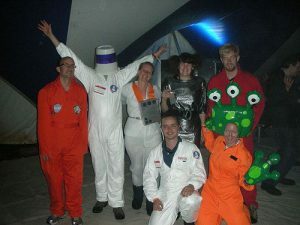 Each evening everyone went to the main tent to take part in the disco wearing fancy dress in the theme of Science Fiction. During the day everyone kept busy, a community event to clear shrubs at the site, a music quiz and welly-wanging were amongst the activities available; I am the 2nd best wanger in the country after being beaten right at the end. I’m so proud. Banbury is a great event for different Rotaract clubs to get together and exchange ideas and experiences. I personally took away a few ideas on how we can get on with recruiting more members, which I hope to be putting a lot of time into over the coming months. We have plans to redesign and promote the website again as this is our main way of promoting the club and the Facebook page is now back and being updated regularly. At the most recent meeting, members got the chance to see the new DVD about district 1140 Rotaract clubs and it is looking great in it’s current version. I have put the DVD onto the Camberley Rotaract Facebook page for any who would like to see it. A few additions are planned and we hope to have the completed version soon. We’d like to say a big thanks to John Meehan who has put this together for us. The district ten pin bowling was another great success with many turning out for the evening’s entertainment. I am happy to report that Camberley won and a good time was had by all. We will be looking to do more with the other clubs in the district and the next event will be Camberley Rotaract’s annual Barn Dance. The date for the event is 22nd October at Collingwood College and tickets are on sale now. There will be a bar with various drinks, a ploughman’s dinner option, a raffle, and of course the barn dancing entertainment itself which is being provided by the Hogs Back Band. All profit from the evening will be going to our chosen charity for the year, the Phyllis Tuckwell Hospice. 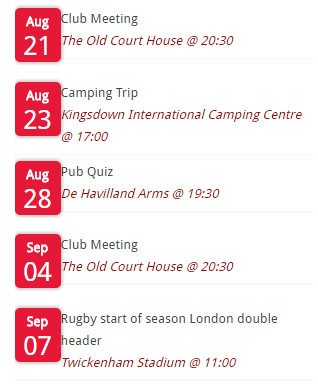 I think that will be all for now, as always, please look at the website diary for future events and I hope to see most who read this at the Barn Dance!